Waffles are the perfect Saturday morning breakfast, or the perfect summertime dessert! 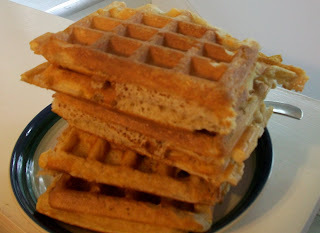 I really like this recipe that includes oat flour to give the waffles a little more whole grain goodness. 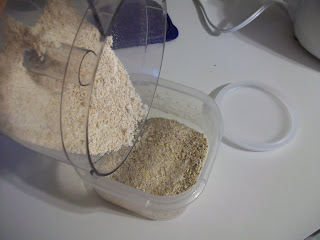 I make the oat flour by grinding up oatmeal in my mini chopper. It doesn't have to be super-fine, just pulse/grind it a few times in a chopper or food processor. If you decide you want to make these often, you can make a whole bunch of oat flour at one time and keep it in an airtight container. 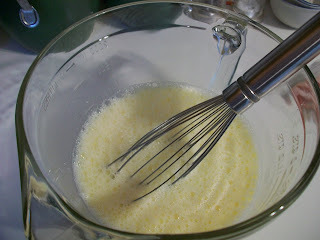 For the waffles, first whisk together the milk and the eggs. Then whisk in the oil and the vanilla. 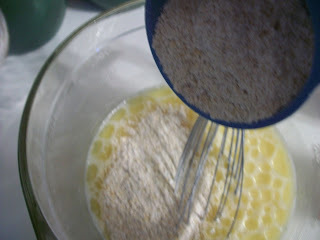 Add the oat flour and the regular flour. 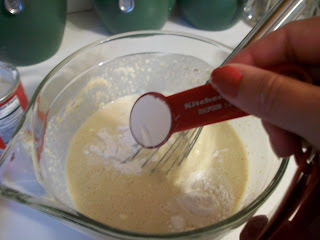 Whisk until the dry ingredients are combined with the wet. Pour into the waffle iron. 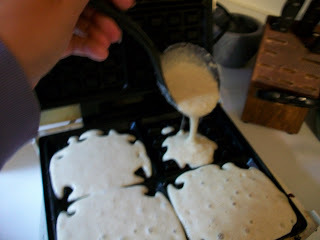 I usually use a ladle to make it easier and to control the amount - I hate cleaning up spilled over batter! Bake according to your waffle maker's directions. Enjoy with fresh fruit, syrup or your favorite toppings! Get more breakfast inspiration at the Ultimate Recipe Swap. There are more recipes at What's Cooking Wednesday. In a large mixing bowl, whisk together the milk and eggs. Whisk in the oil and vanilla. Add the dry ingredients and mix until just combined. Ladle onto hot waffle iron and cook according to manufacturer's directions. Serve with syrup and fresh fruit. Makes 12 square waffles. Oh yum!!! Thanks for you comment over at The Krazy Kitchen! I was just looking over just your front page and see that you have things posted to fit into all our different memes! I can't wait to have you start linking up! By the way, it's ok to link up older posts too since things move so quickly at The Krazy Kitchen with 7 different ladies posting 7 different memes all week! These sound great. I love oats and waffles.